edited by Waldo E. Johnson, Jr.
With original research and a special eye toward enhancing social work and social welfare intervention practice with this subpopulation of American society, this volume will interest researchers involved in African American issues, students, practitioners, and policy makers. 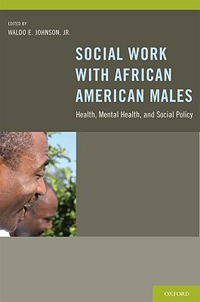 Chapter authors, both established and emerging scholars of social problems relevant to African Americans, offer an overview of the social and economic data on black males to date and the significant issues that affect them from adolescence to adulthood. Via qualitiative interviews as well as comprehensive surveys and data sets, their physical, mental, and spiritual health and emerging family roles are considered within both individual and communal contexts. Chapters cover health issues such as HIV and depression; fatherhood and family roles; suicide; violence; academic achievement; and incarceration.